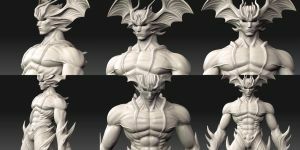 As ZBrush projects go, this one was poorly planned and so I didn't have enough resolution to fully detail him, but that's okay. It was a great learning experience and exercise, and I'm particularly proud of the "ear" area. Wow, amazing detail! Fantastic work! Thank you! He definitely took awhile, but I'm glad all the love and care I put into him shows! So detailed! He looks great. Thanks so much! I appreciate the compliment. No prob! It's really nice ^^.